Sun Tzu is better known to Chinese as Sun Zi, or Sun Wu. He is the author of The Art of War, an influential ancient Chinese book on military strategy. Through this book, Sun has had a huge impact on Chinese and Asian history and culture. Since the 19th and 20th centuries, Sun's The Art of War has grew in popularity in Western society as well. 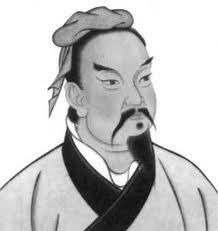 Sun Tzu lived in the Spring and Autumn Period of China (722–481 BCE) as a heroic general of the King of Wu. According to traditional sources, such as the 2nd century BCE biography written by Sima Qian, Sun was born in Qi (now Shandong Province) during the Spring and Autumn Period of China (722–481 BCE). His real family name is Tian, but the last name of Sun was given by King of Qi State to his family when his grandfather, a general for Qi, won a big battle. When Sun Tzu was young, his family was having trouble with some royal families, and he moved to Wu state and became a heroic general for the king of Wu, Helu. His victories then inspired him to write The Art of War. Historians place the writing of The Art of War in the Warring States Period (476–221 BCE), based on its description of warfare. The period was a time of constant war among seven nations (Zhao, Qi, Qin, Chu, Han, Wei and Yan) seeking to control all of China. Sun Wu, a native of Qi, presented his work, The Art of War, to King He Lu of Wu and secured an audience with him. I have read all thirteen chapters of your book," said the King. "Will you train my people on a small scale as an experiment for me to see?" "Yes of course," replied Sun Wu. "Will you try on women?" "Do you know the front from the back and your left hand from your right?" The women assured him they did. "When I give the order to advance, go forward. At the order 'Left!' turn towards your left hand side, at 'Right!' turn towards your right hand side and "Retreat!" to turn back. Understand?" They replied, "Yes. We understand all what you had said." Having laid down these commands, Sun Wu had the executioners' swords and axes made ready and repeated his instructions time and again. Then with the beating of the drum, he gave the order "Turn right!" The women burst out into laughter without making any move. Sun Wu said, "If the rules are not clear and the orders are not understood, the commander is to be blamed." So he repeated all the commands again in details, and he made sure that the women understood it. He beat the drum again and gave the order for a left turn. But once again, the women burst out laughing. After seeing all this, he said, "If the rules are not clear and the orders are not understood, the commander is to blame. But when orders are given clearly yet not carried out, it is the officers who are to blame." Immediately, he ordered that the two company leaders be executed. The King, watching from his stand, was aghast to see that his favorites were about to be executed. 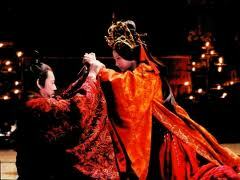 He hurriedly sent a messenger to Sun Wu with the order against the execution. "I can see that you are a competent general. But without these two concubines, my food and wine would lose all flavor. Please spare their life." Sun Wu replied, "Since I have been appointed as the commander of the army, I am not bound by all orders from my sovereign." So he had the two leaders beheaded as a warning to those who planned to disobey his orders. Then he appointed the pair next in order as new leaders. This time when the drum was beat, the women obeyed all his commands, not daring to utter a single word. Then Sun Wu sent a message to the King informing that the troops are well trained and ready for inspection. "You may go back and rest, I have no desire to inspect them." Sun Wu said, "Your Majesty is interested in theories but not in practice." King He Lu, convinced of Sun Wu's skill as a commander, later made him his general. In the west, Sun Wu defeated the powerful state of that time, Chu, and captured Ying, the capital of Chu. In the north, he struck terror into the states of Qi and Jin. His fame spread far and wide among the feudal lords. Sima's biography claims that Sun Tzu later proved on the battlefield that his theories were effective, that he had a successful military career, and that he wrote The Art of War based on his tested expertise. His descendant, Sun Bin, also became a famous scholar of the military arts. Sun's Story became a TV series. According to the TV version, one of the king's favorite concubines, who was beheaded by Sun during the training session (see above quoted text), had a younger sister. This sister tried to kill Sun when she was given to Sun as his second wife by the king. Later she and Sun developed a very close relationship. Sun Tzu's The Art of War has influenced many notable figures. Traditional histories recount that the first emperor of a unified China, Qin Shi Huang, considered the book invaluable in ending the Age of Warring States. The Princess of Chu, older sister of the king of Chu, chanllenged Sun again and again about why he wrote a book to help shed blood. Japan was introduced to The Art of War c. 760 CE, and the book quickly became popular among Japan's generals. The publication also significantly influenced the unification of Japan. Mastery of its teachings was considered a mark of respect among the samurai, and its teachings were both exhorted and exemplified by influential samurai such as Oda Nobunaga, Toyotomi Hideyoshi, and Tokugawa Ieyasu. Historians popularly recount how French emperor Napoleon studied Sun's military writings and used them to successfully wage war against the rest of Europe. The emperor's disregard for central principles such as attentiveness to temporal conditions is largely credited for his eventual defeat in Russia. Admiral of the Fleet Togo Heihachiro, who led Japan's forces to victory against Russia in the Russo-Japanese War, was a famous disciple of The Art of War's teachings. During the Gulf War in the 1990s, General Norman Schwarzkopf, Jr. practiced Sun Tzu's principles of deception, speed, and attacking the enemy's weakness. Mark McNeilly writes about Sun Tzu in Sun Tzu and the Art of Modern Warfare " target="_blank">the Art of Modern Warfare that a modern interpretation of Sun and his importance throughout Chinese history is critical in understanding China's push to becoming a superpower in the 21st century. Modern Chinese scholars explicitly rely on historical strategic lessons and The Art of War in developing their theories, seeing a direct relationship between their modern struggles and those of China in Sun Tzu's time. There is a great perceived value in Sun's teachings and other traditional Chinese writings, which are used regularly in developing the strategies of China and its leaders.